For home improvers, remodelers, DIY projects, extensions, and loft conversions. 3D Architect Home Designer is an ideal entry point into home design software. A simple solution for those wanting to visualize home improvements, an extension project or loft conversion for example. 3D Architect Home Designer will enable you to easily draw your building and visualize it in a detailed 3D model. Eleco Software Limited, develops & supports a range of 3D CAD applications suitable for all levels and aspects of architectural design and visualisation. Eleco Software Limited is subsidiary of Elecosoft plc. Elecosoft provides software and services to the architectural, engineering and construction industries. The group is based principally in United Kingdom, Sweden and Germany and has a broad portfolio covering project management, construction, timber engineering and design, 3D visualisation and marketing sectors of the construction industry. The 3D Architect Home Designer enables you to draw in a more flexible environment than ever before. With two distinct work-spaces, you can quickly and accurately design floor plans in our 2D construction mode and check the results instantly in the 3D model in design mode. One of a number of different ways to construct a design in 3D Architect Home Designer, the room planning tool enables you to build a complete floor-plan one room at a time. Select a room shape which closest matches to the design you have in mind and add to your plan area. Then add a dimension for each wall to create an accurate sized room. Repeat the process with other rooms to create a full floor-plan. Our doors library contains many standard door types covering internal and external doors as well as garage doors, patio doors and an All new bi-fold door tool. The door library is just the starting point. All of the door components can be edited in great detail to ensure your project represents the elements you are using on your build. 3D Architect Home Designer provides a variety of different view types to suit all requirements and styles. Each of these can be further customised with line styles, patterns and colours. As well as standard 2D construction mode and 3D design mode, you can use sketch mode, colour overlays and numerous surface toggles to ensure you show your designs at their best. The perfect visual tool for spacing, sizing, measuring and adjusting your building elements. Our NEW in-line measurement tool provides a fast, easy and visual method to make changes to the elements of your design quickly and easily. Usable in both 2D construction mode and 3D design mode, in-line measurements can be used to change sizes and positions of doors, windows, walls, roofs etc. Lock parts of the element that you don’t want to be effected or show the effects of drag-and-drop re-positioning. The extensive window customisation tools allow for endless variations to be produced. Select a window from the existing library and change any aspect to ensure it suits your design requirements. Save your selections, preferences and new designs to the window library for future projects. The flexible staircase tool now allows for much greater freedom of design. Choose from a myriad of options to define all elements of the stairs, balustrades, risers and treads. Customise your 2D display to suit your preferred presentation style. Taking our expertise in simplifying the creation of complex roof structures a stage further, our new roof designer provides clearer dialogue options to help understand the elements that can be controlled. With more flexible details available to each roof side, the construction and display of even the most complex of roofs is easier than ever before. Create unique designs using the powerful dormer window tools. With all of the standard dormer styles available from a single menu option. Select the correct profile and customise as required with full control over pitch, window size and quantity and advanced options such as roof breaks. As part of the property design process, add in the details of your plot and use the landscaping tools to shape and contour your garden. Add individual height points to replicate known topography for a realistic representation of the property and plot in full 3D. Q. What happens after I have placed my order? Once your order for a download version of the software is completed and processed, you will be emailed a download link and serial number for activation of your software. You will be up and running instantly. Q. Can I produce drawings for planning submission? Plans from Arcon Evo and the 3D Architect Home Designer software range can be output to a variety of different scales, fully and accurately dimensioned, on a variety of page sizes. They are suitable for submission to your local authority for planning approval and many of our existing users have achieved this, often with no previous experience. As always, we would recommend referring to your local authority as early as possible to ensure you create plans that meet their requirements. Plans from Arcon Evo and the 3D Architect Home Designer software range can be output to a variety of different scales, fully and accurately dimensioned, on a variety of page sizes. They are suitable for submission to your local authority for planning approval and many of our existing users have achieved this, often with no previous experience. As always, we would recommend referring to your local authority as early as possible to ensure you create plans that meet their requirements. Q. How are elevation and section views created? Once you have drawn up your floor plans, elevation views are generated automatically from these. Building sections can be defined also and viewed in both 2D and 3D (Arcon Evo only). In Arcon Evo there is a new Plan Elements mode that allows you to generate individual elevation/section views that are then stored in the database. These can be easily accessed and modified to your own requirements. Q. What about building regs and working drawings? Included with 3D Architect Home Designer Expert are powerful 2D drawing and editing tools enabling fine detailed and working drawings to be created if you have the knowledge. Additionally with the ability to quickly import and edit existing CAD blocks (DXF/DWG) you can include more detail into your plans to ensure your drawings are suitable for multiple uses including building control. Q. 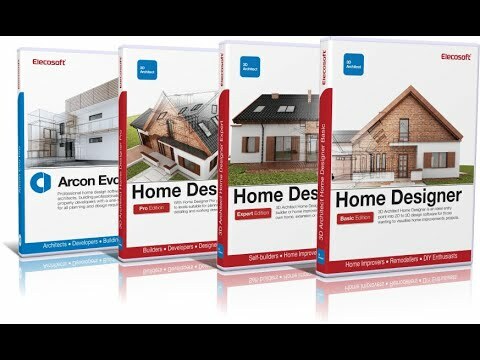 How can I save money and win more jobs with your home design software? Our software is the perfect solution for drawing plans for new-builds, loft conversions, garage conversions and every other form of house extension. Therefore you'll be able to put drawings forward to customers and win the job. If for what ever reason you may not win the work, you still save money because you won't have to pay an architect hundreds of pounds to create drawings for nothing. Q. Can I save my project and send the 3D design to my clients? Yes simply save the file to your computer and when emailing, attach it as normal. Your client simply has to save the file to their computer, visit our O2C website and load the file to view their house in 3D on their screen instantly, zoom in and out, spin it around and walk through it.